The feature is already available for most accounts. You can set in in the new blogger interface under Settings->Posts and comments. And it only does work with the new blogger interface, which still misses an enclosure link box for podcasters and publishers. However, it's not the long-awaited automatic share feature for Google+. It still involves an action by yourself, which means that if you blog from a mobile client, or via email, the feature is not available to you. There is a lot of hopes for that. 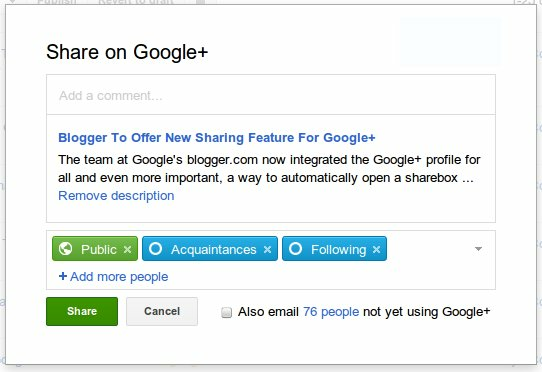 Including to select if you want to post to a Google-Page or to your personal account. But it's good to see there is progress and Blogger gets a bit towards Google+.